Jurgen Klopp could be forced into a couple of changes to his starting lineup as Liverpool welcome Crystal Palace to Anfield on Saturday. The Reds host Roy Hodgson’s Palace in the knowledge that another victory will ensure at least a four-point buffer is maintained atop of the Premier League table with 15 games of the season remaining. They return to Anfield off the back of a 1-0 win over Brighton last time out—which ended a two-game losing streak but also raised a number of fitness concerns. Although the end of the Palace game signals the start of an 11-day break before the Reds’ meeting with Leicester, with injuries to consider Klopp could look to err on the side of caution. While the crux of Liverpool’s side is likely to remain unchanged, the fixture does leave the manager with decisions to make when finalising his starting lineup. Klopp delivered unexpected injury news during his pre-match press conference. Trent Alexander-Arnold had been expected to miss up to four weeks of action after picking up a knee injury during the win at Brighton, but Klopp revealed he is “really close” to being in contention to start. While it remains to be seen whether he will risk the young right-back, the news comes as a major boost as it suggests his return could come against Leicester at the latest. With Joe Gomez still unavailable, it leaves James Milner as the most likely replacement at full-back should the decision be made to sit out Alexander-Arnold. The manager also revealed that Joel Matip is 100 percent available, but the game comes too soon for Dejan Lovren, while Adam Lallana has resumed full training. 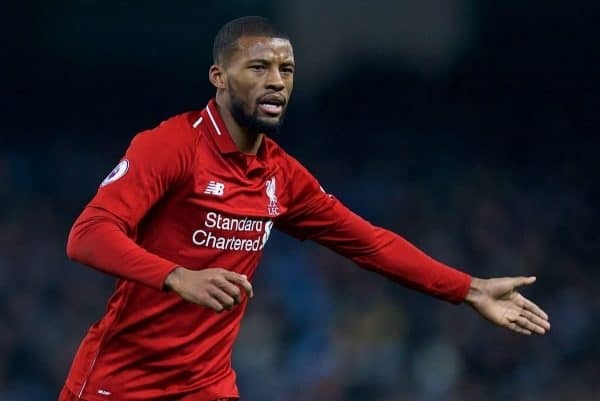 Gini Wijnaldum, on the other hand, also requires a late fitness test after picking up a knock on the south coast, but having featured in all but one of Liverpool’s Premier League games to date he could be handed a break. His absence could open the door for Naby Keita to slot into the side, but he is likely to face stiff competition from Xherdan Shaqiri. 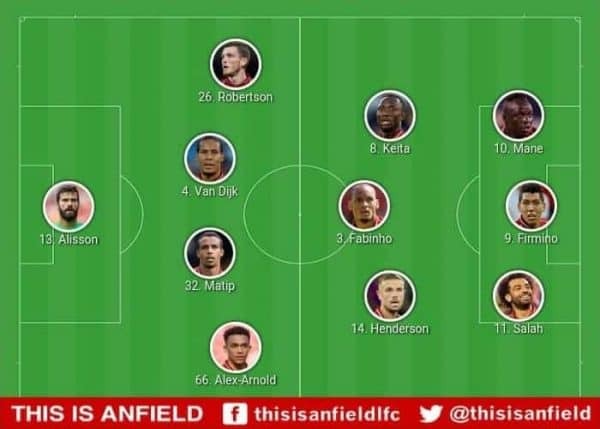 The core of the team who returned Liverpool to the winning list against the Seagulls are all set to remain in the starting lineup, with Alexander-Arnold and Wijnaldum the likely absentees. 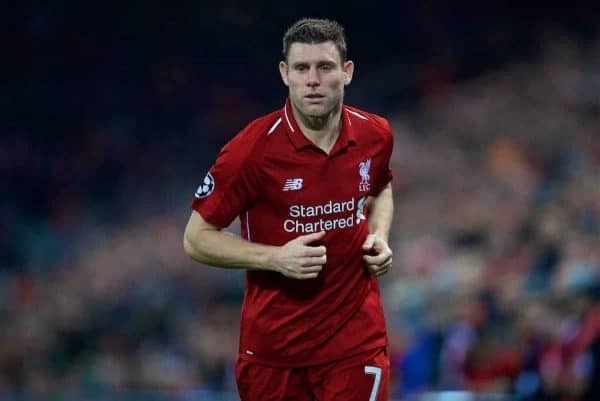 The absence of the former will see the Reds turn to Mr. Versatile himself Milner to line up at right-back, while the remainder of the defence moves closer to returning to full strength. 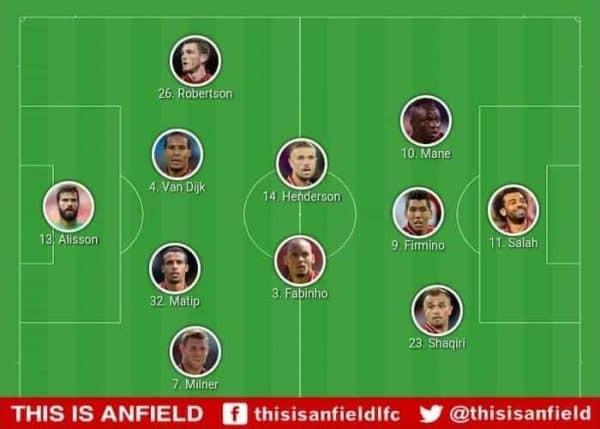 With Matip expected to return to the fold, Fabinho will move back into midfield alongside captain Jordan Henderson and replace the Dutchman as part of a double pivot. If Alexander-Arnold proves his fitness, however, Klopp could opt for a return to a 4-3-3 formation and hand Keita another opportunity to stake his claim for a more regular role in the side. The Guinean’s inclusion would likely see Shaqiri move onto the bench to act as an impact sub later in proceedings should Palace succeed in frustrating Klopp’s side in the final third. 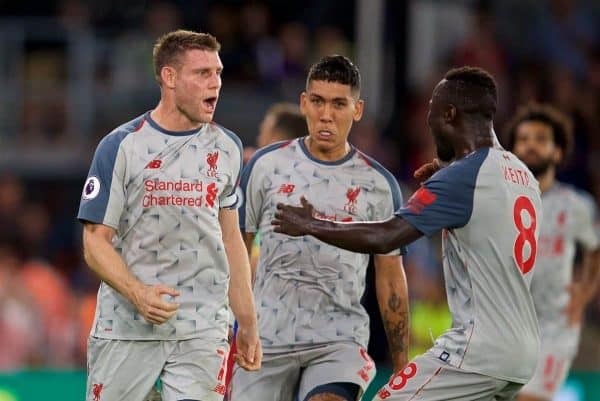 The Reds should have enough firepower with the usual forward three, however, with Roberto Firmino, Mohamed Salah and Sadio Mane having notched a combined 10 goals in their last seven games combined. After returning to winning ways in the Premier League at Brighton, the Reds again have the opportunity to put pressure on their closest rivals and ensure at least a four-point gap is maintained heading into matchday 24. Both lineups are more than capable of achieving the desired result, but only time will tell how Klopp opts to handle his squad’s latest fitness concerns.